﻿These handmade photo covers are made specially for Wayne & Elaine from Taiping, Perak. They would like to insert a wedding photo in each of these cards to be given to their family and friends. To open this card, you have to slide off the ribbon. Her wedding card theme is "Ivory and Dark Purple". If you like this design to be a wedding invitation card, please click on the contact button to get your quotation. 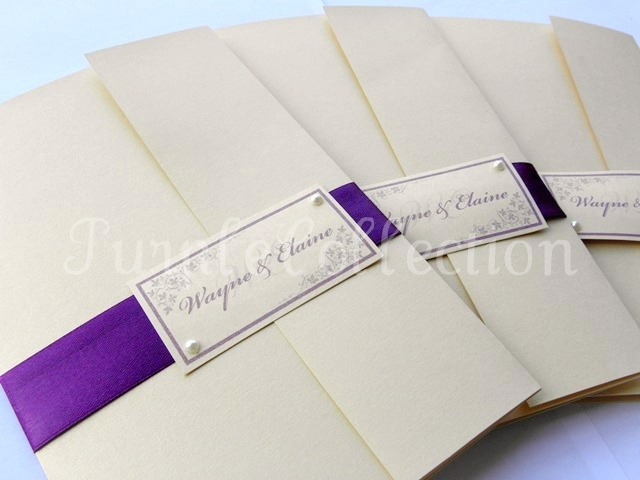 Materials used: Ivory pearl shimmering card, dark purple satin ribbon, acrylic flatback ivory pearls.